For some reason us geeks enjoy posting pictures of crashed computer screens "in the wild." Like THIS boot sequence in Time Square. 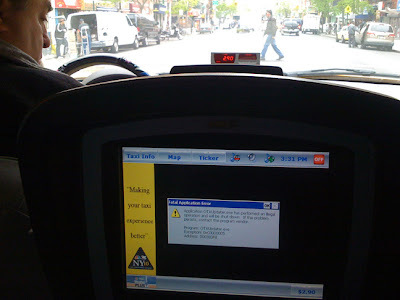 So in the same spirit here is a "fatal application error" in a cab on Avenue A. If you must ask I guess the answer would be "because it's there."